Comparable in style to a frontispiece design by Charles Le Brun in the Metropolitan Museum of Art, New York (J. Bean, 15th-18th Century French Drawings in the Metropolitan Museum of Art, New York, 1986, p. 146, no.157). 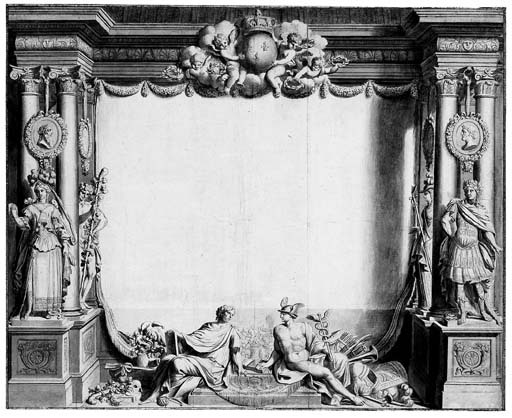 The Le Brun drawing, which was engraved by Michel Lasné in 1642, shares with the present sheet a crisp modelling of forms achieved through a theatrical sense of light. Marijn Schapelhouman has kindly pointed out that this drawing is by Jan Goeree (1670-1731).